A Certain Slant of Light starts off from a very unusual position: it is narrated from the POV of a ghost, a young woman named Helen who has been dead for over one hundred years, and her narrative voice reflects that fact, as well as her being twenty-seven at the time her death. Her voice is a delightful blend of her old-fashioned original voice with the occasional modernity she has picked up over the span of her time as a Light - a term she uses for her state of being. Her language is poetic and elegant, and overall beautiful to read. That was what got me about this story: her voice is utterly charming, and the fondness with which she talks about the humans she has attached herself to over the years - her Saint, her Playwright, her Poet, and now her Teacher - is just the same. While A Certain Slant of Light is a ghost story - both Helen and the other main character, James, are ghosts/Lights - it is also a story about the simple beauty of life. Helen's joy at being able to feel things after taking over an empty body is breathtaking in the simplicity of those things that we would normally brush aside or take for granted: tasting an apple, smelling flowers on the air, taking showers and simply being seen by others are some of many examples I could give. And the tragedy and difficulty is not limited to the ghosts either - for all the wonderful things about being alive, the living characters do not see the good in that. They are just as flawed and messed up as the dead can be in A Certain Slant of Light, and perhaps even more so. Jenny and Billy, the two very different young people whose bodies Helen and James come to possess, have given up and no longer see the gift that is life as it is to Helen and James, but even they (and so many others) have a chance to improve things and see the truth, while Helen and James continue their search for who they were, who they are, and who they still might be. 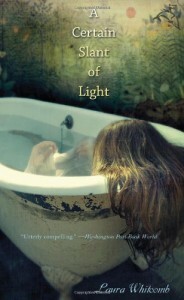 A Certain Slant of Light is a wonderfully-written debut novel full of beauty and bitter-sweetness.